Neloski Blog | Tim Jacobs unleashes secret weapon and wins again! Tim Jacobs unleashes secret weapon and wins again! One week out from the the Dubai Shamaal we have had our last hit out in the Manly Wine Bar ‘King of the Harbour”. A 15km down wind race from Fishermans Beach to Manly Cove. The pressure was on with everyone going to Dubai trying to get the last confidence boost before we jet off. Favorites were Murray Stewart, Dave Smith and myself. All week the conditions were looking fantastic with a 20knot North Easter predicted to blow all week and on race day, and it did not disappoint. The wind was up pushing steep nor east runs all the way down the coast to the entrance of the Harbour. The pace was set early by Murray Stewart taking off like a rocket and managing to drop all in his wake after the first bouy turn 2km into the wind. With my usual slow start I found myself paddling around the front pack latching onto Dave Smith after the bouy and trading runs while Murray pulled out to 50m on some screamers. The course was fantastic, with nothing in between us and North Head it was a matter of pick your own course and go for it. Murray looked strong out in front and I let him set the pace, staying a run behind him for the first half of the race. It was now a two horse race with Muz and myself out in front trading run for run, both knowing the mind games that would be playing on each other if either won leading into the Shamaal. As we neared Bluefish Point the course got more technical with the runs holding up and peaking due to the backwash coming off the rocks. Last night I put a new secret weapon on my ski and it did not disappoint….a longer rudder. The croc surfed the runs without missing a beat, as good as the croc already is the new dynamic of the longer rudder pushed it over the edge and it didn’t miss a run. I got a sniff of the lead at Bluefish and didn’t look back knowing that the last 3-4km were going to be a grind into the Harbour in the flat. 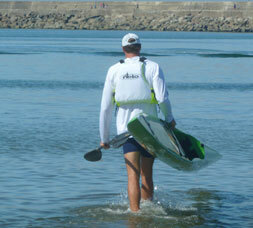 Knowing that Muz can paddle a 3.30min 1000m, I didn’t want to leave it to a sprint finish. Around the back of North Head I pushed on every run and backwash available and chased them all down, pushing through the backs of them and getting spat out the front down the face of the one infront. Coming into the Harbour I had a 200m lead on Muz and didn’t waste a stroke knowing how strong he is, also with Dave Smith in 3rd a 1000m A final kayaker in his own right. The placings stayed like that all the way to the finish, with me remaining undefeated in the series and gaining a solid confidence boost leading into Dubai in 6 days time. The course was fantastic and could very easily be turned into a World Championship course, supporting all conditions with a long downwind for the majority of the race. Look out Dubai because here come the Aussies!